Once the gold standard of the Internet age, with catchy nationwide advertising campaigns and the lion’s share of Internet search traffic, Yahoo is now facing angry investors who want Chief Executive Marissa Mayer kicked out and partner Microsoft is currently working with investors on selling off the core business. Yahoo has seen its market share eroded over the years, with Google and Facebook gobbling up online advertisers and leaving them struggling to stay afloat. Longtime search and advertising partner Microsoft is trying to get investors together for a sale, with hedge fund Starboard Value LP recently seeking to overthrow the company’s entire board, including oft-criticized CEO Marissa Mayer. The simple answer is perhaps it’s not something Yahoo did, but what it didn’t do. It simply hasn’t had the foresight as companies like Google and Facebook, and it hasn’t figured out a way to catch back up to them. Mayer was brought in to deal with that stagnation, but over her tenure, the turnaround just hasn’t happened. As Facebook’s annual revenue continues to skyrocket, Yahoo’s revenue has flatlined over the past decade, and if anything is showing a downward trend, struggling to break the $5 billion annual threshold as Facebook approaches $20 billion. There’s a lot of debate over whether Mayer’s at fault or Yahoo’s fate was sealed years ago when it allowed Google and Facebook to take over. Many have taken to Twitter to defend Mayer’s performance and argue that Yahoo had become irrelevant long ago. Mayer has only been with the company for about three years, long after Yahoo had since dropped from being a top search engine and Internet news source. In fact, Mayer herself played a big role in helping Google get to where it is today, joining the company in 1999 as its first female engineer, and rising in the ranks when it hit it big. 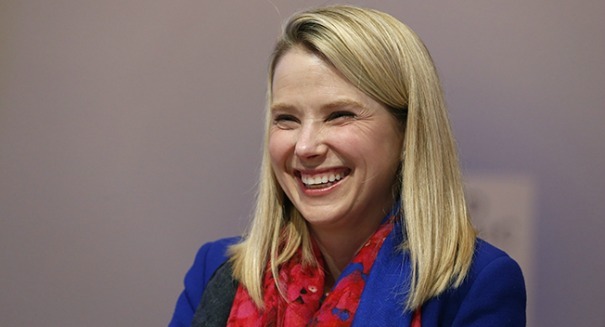 So ironically, she may be a big part of the reason why she couldn’t get anywhere with Yahoo.